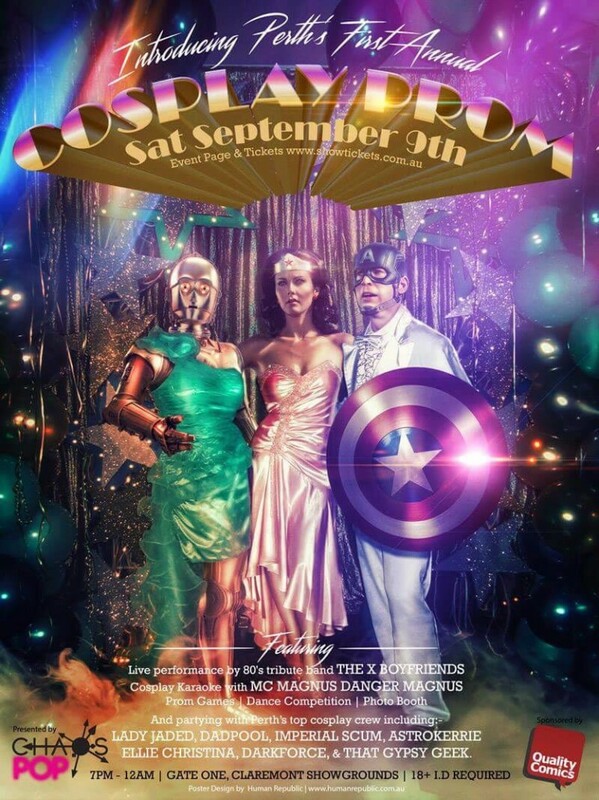 Chaos Pop Culture invites you to be part of an evening of dance, romance and… cosplay? Calling all pop culture nerds, gaming geeks and comic book lovers to Gate One Theatre on Saturday Sept 9 for the CHAOS POP COSPLAY COMMUNITY PROM! Get dressed in your finest costume and get yourself a dance partner, as we celebrate our love of all things nerdy! There’s a huge p.a and lighting system, 3 massive screens running visuals, a live band, DJs, competitions and games (for those who register) AND.. 2 HOURS OF COSPLAY KARAOKE with Magnus Danger Magnus! Live music from THE X-BOYFRIENDS, performing 80’s prom classics. The X Boyfriends have performed at prom nights for venues such as Devilles Pad and features Laith Tyranny on vocals, Damien Goerke and Matt Geary on guitars, Alwyn Nixon-Lloyd on keys, Matt Harskamp on bass and Scott Howard on drums. with more special guests to be announced! We’ll also be having stalls for local art and comic book shops in the foyer. This is an 18+ event with a fully licensed bar.